Professor Webb is a physician and pharmacologist based at the Queen’s Medical Research Institute and Royal Infirmary of Edinburgh. He led Edinburgh’s Cardiovascular Research Initiative and University Centre for Cardiovascular Science, and currently directs the Translational Medicine and Therapeutics Initiative (STMTI) and is pharmacology lead for the Scottish MRC Clinical Pharmacology and Pathology Programme. He leads Edinburgh’s Hypertension Excellence Centre, and his research is on the pathophysiology of hypertension, particularly focused on the role of the vascular endothelium and renal disease. 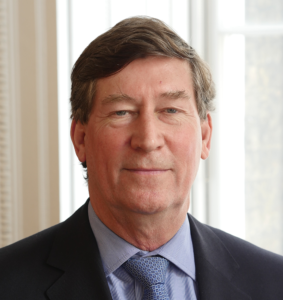 In Scotland, he has been President of the Scottish Society of Physicians and Chairman of the Scottish Medicines Consortium (SMC), having been chair of its New Drugs Committee, and previously involved in SMC’s creation. Professor Webb is currently President of BPS, having previously held the roles of Vice-President Meetings and President-Elect. He is also currently a Non-Executive Director of the Medicines and HealthCare products Regulatory Agency (MHRA) and Chair of the Scientific Advisory Committee for the National Institute for Biological Standards and Control (NIBSC). He is Honorary President of the European Association for Clinical Pharmacology and Therapeutics and Vice Chair of the Clinical Division of the International Union of Basic and Clinical Pharmacology (IUPHAR). He is a Fellow of the Royal Society of Edinburgh and of the Academy of Medical Sciences, where he has been involved in Working Groups on Safer Medicines, the Regulation and Governance of Medical Research, and Methods of Evaluating Evidence.